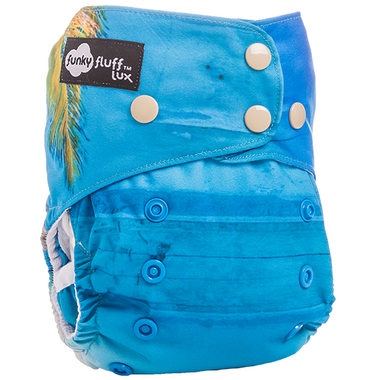 This Funky Fluff Swim diaper features a double gusset, a mesh interior, 4 rise setting, hip snaps and cross over snaps. No need to add anything under or over this swim diaper, it is accepted in a majority of pools and swimming lessons. Please note: primary image shows the back of the swim diaper. Secondary image shows the first of the swim diaper.